The Ford line up is chock full of automobiles whose name start with the letter F: F150, Focus, Fiesta, Fusion, and Flex. Back in the late 80's and early 90's, the Festiva name plate was the bottom rung on the car ladder. 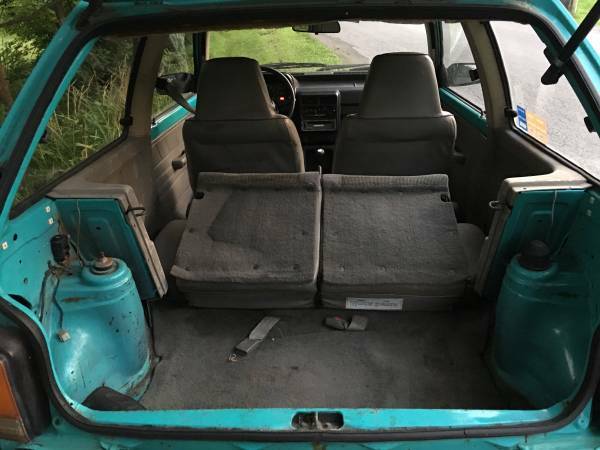 The owner of this aqua hatch sums things up well when he says this about the Festiva, "very few cars can hold a washing machine and still deliver 30+ mpg." The 63 hp 1.3 4 cylinder engine only has to haul around 1700 lbs so things aren't as bad as you might think. 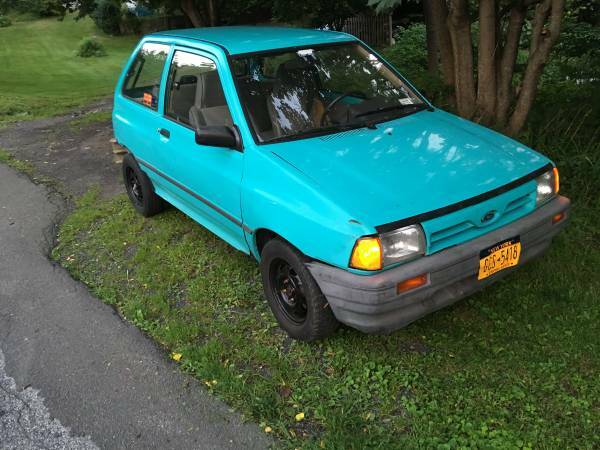 Find this 1993 Ford Festiva for sale in Plattekill, NY for $750 via craigslist. 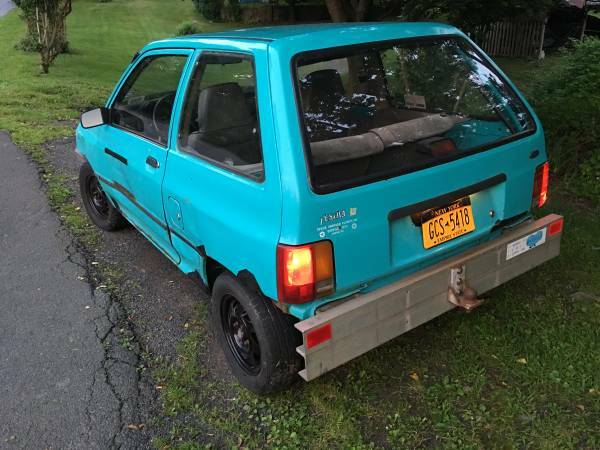 The seller seems to be a big Festiva fan and is very knowledgeable of the model. He mentions the car was sold overseas as a Kia Pride and also as a Mazda 121. They extol the virtues of the car's simplicity: no power windows, no AC, no power steering, and 5 speed gearbox. A later Ford Aspire donated its suspension and brakes to this car yielding 4x100 wheels and a claimed 40% bigger brakes than stock. One of the most peculiar and intriguing aspects of the car is the Mad Max style rear bumper. The seller wants 100 more clams for the "custom heavy gauge aluminum tow bumper." What is the tow rating of a Festiva??? These cars have a strong online community and turbo Mazda engine swaps create a fast tin can. The interior shot above shows automatic seats belts that were the scourge of cars of this era. The seats could benefit from Stanley Steamer or some sort of hazmat approved cleaning. 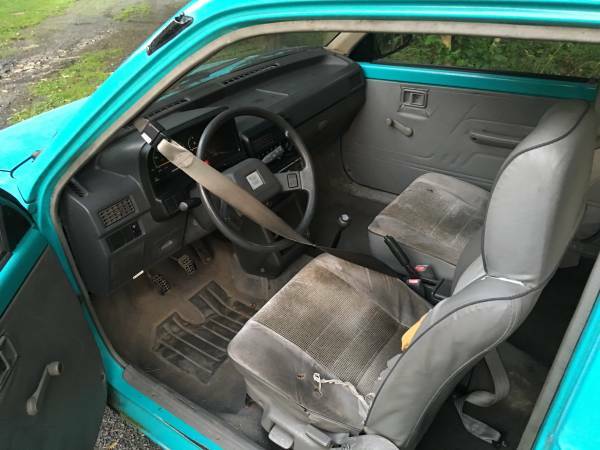 The following parts are included in with the sale: decent stock seats, two good tires, two exhaust systems, pair of struts, and stock rear bumper. Work that needs to be addressed includes one front strut, rust issues, exhaust leak, bad axles, and speedo gear. Cory has his 1995 Mercedes C36 AMG at the body shop getting some love from the Dent Eraser.